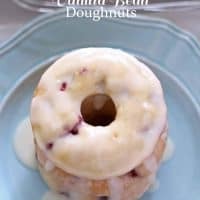 If you find yourself with a cup of cherries, make these easy baked cherry vanilla bean doughnuts! You won’t be able to eat only one. Do you like doughnuts? Cause I sure do! I overbought cherries (again!) so I decided to make doughnuts out of them. There’s nothing like doughnuts to make a bad day better. My bad day wasn’t serious or anything. Just one of those days. It started off pretty blah with a to-do list longer than anyone’s list should ever be. Crossed off a few items and then Mr. B and I decided to try out a new recipe. We bought a pizza stone for the grill a few weeks ago and decided it was a good day to try it out for the first time. I concocted a weird sounding but delicious tasting-in-my-head pizza recipe – the ingredients are really not important because the pizza really sucked. My mental palette failed me. The imitation mozzarella cheese that Mr. B. bought by accident also failed me. People, don’t buy imitation mozzarella cheese. Seriously. It looks normal, but doesn’t melt and has a freaky texture when you eat it. I don’t know how he confused them. But I can assure you neither one of us will ever buy imitation cheese again (on accident or on purpose). On top of that, I forgot to put oil or flour (whatever is supposed to make the pizza unsticky) on the pizza stone, and we couldn’t even saw the pizza off of it. The combination of unmelted fake cheese and pizza pieces went into a bowl and we tried to eat it. Our neighbor politely declined our offer to try my experiment and I don’t blame him one bit. I was bummed (and hungry), so I decided to make doughnuts. Lesson of the day – any spectacular kitchen fail can be quickly cleared up by a good doughnut. We don’t really fry things in my household (high cholesterol and blood pressure must be thwarted! ), so baked doughnuts are how we do it here. Not that baking them makes them healthy but in my head they’re slightly better for you. 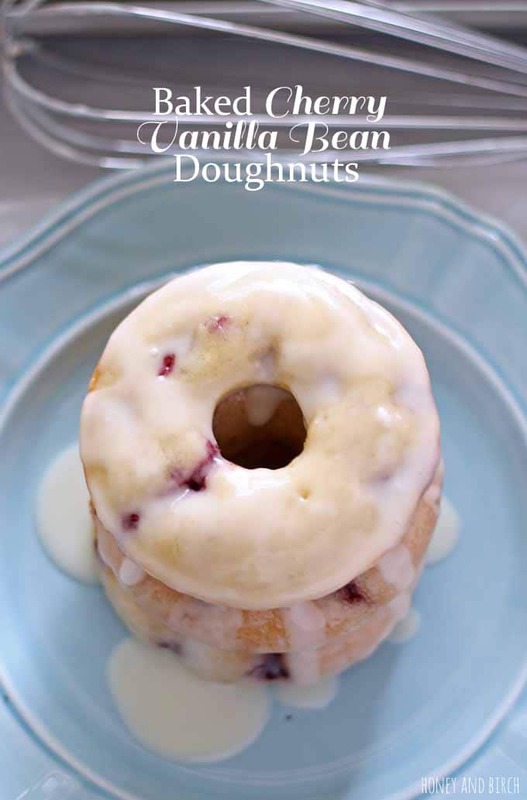 These baked cherry vanilla bean doughnuts are really easy to make. 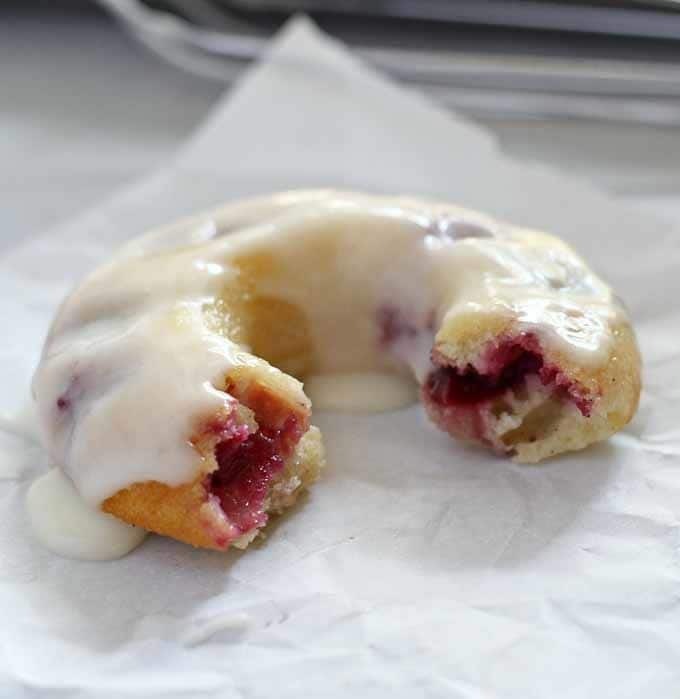 The cherries’ flavor definitely takes over the doughnut but a very vanilla glaze helps bring out the vanilla beans. 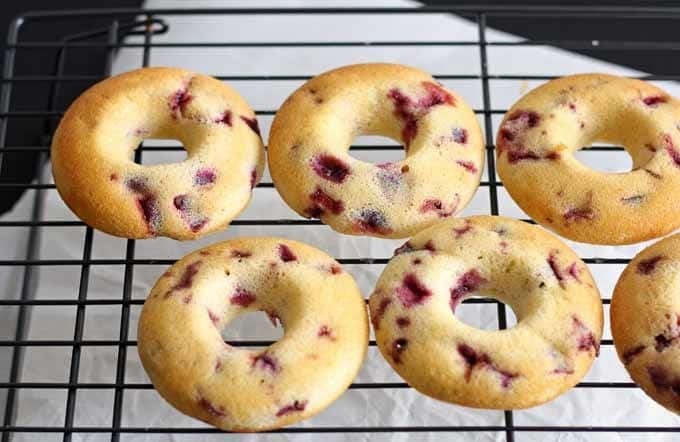 They’re really easy to make and all you really need is a doughnut pan – I picked up mine at HomeGoods awhile ago but I see them there all of the time. I only have one – if you’re out and about buying one, consider buying two. Just saying. Before you begin mixing the dough, prep your cherries and vanilla beans. At least that’s what works for me – I chopped up all my cherries and scraped my vanilla beans and then the whole prepping/baking process was fast. After the finished doughnuts cool, the glaze mixes up super fast and then you’re ready to glaze and eat. Preheat oven to 350 degrees. 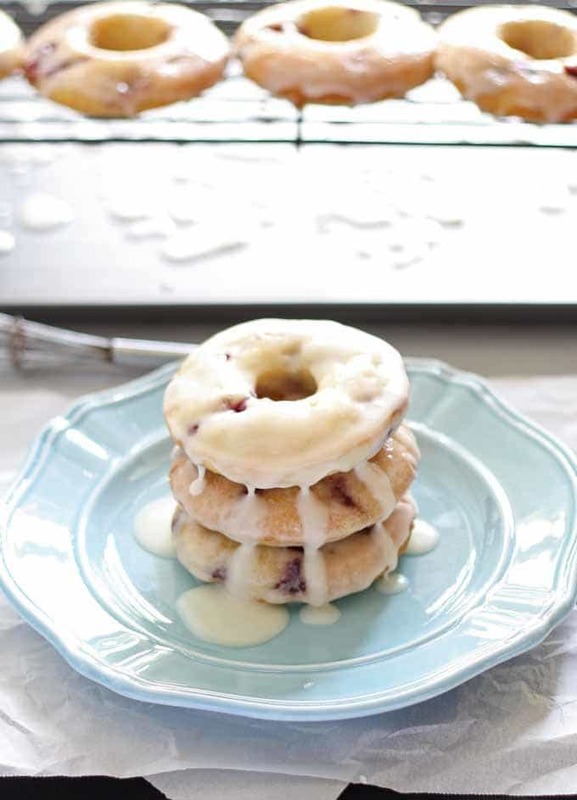 Grease the doughnut pan with extra butter or cooking spray and set aside. In a small bowl, whisk together the flour, sugar, baking powder and salt. Set aside. Combine the milk, butter, vinegar, vanilla extract, vanilla seeds and egg in a small saucepan over medium heat. Stir constantly until the butter melts. Add butter mixture to flour mixture and with a wooden spoon, stir to combine. When the mixture is combined, fold in the cherries. Spoon or pipe the mixture into the prepared doughnut pan. Bake for 13-14 minutes until the finished doughnuts edges come off the pan. Remove from oven and let cool for 1 minute, then finish cooling on rack. If using the same pan again, wait 5 minutes before filling the pan a second time. Combine all ingredients in a small bowl with a wire whisk. Wait 1-2 minutes for the glaze to thicken before dipping the doughnuts in the glaze. 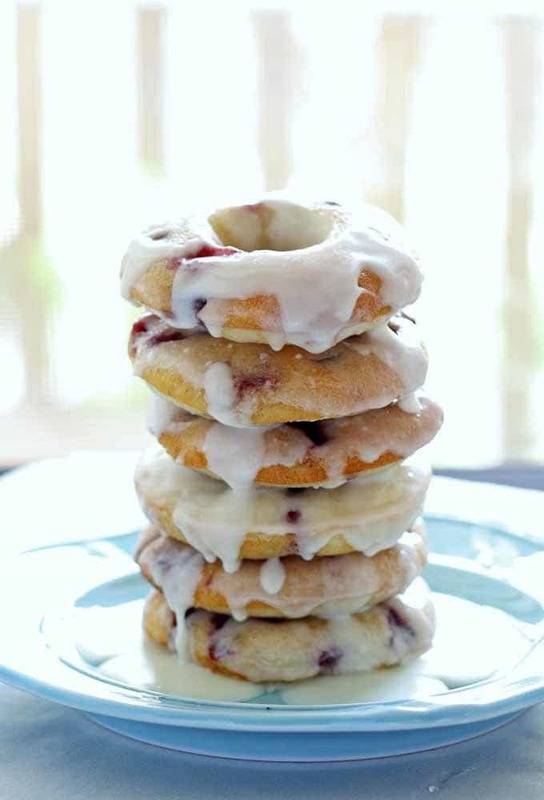 Doughnut recipe adapted from Diethood. br]Glaze recipe adapted from [Cooking Classy. 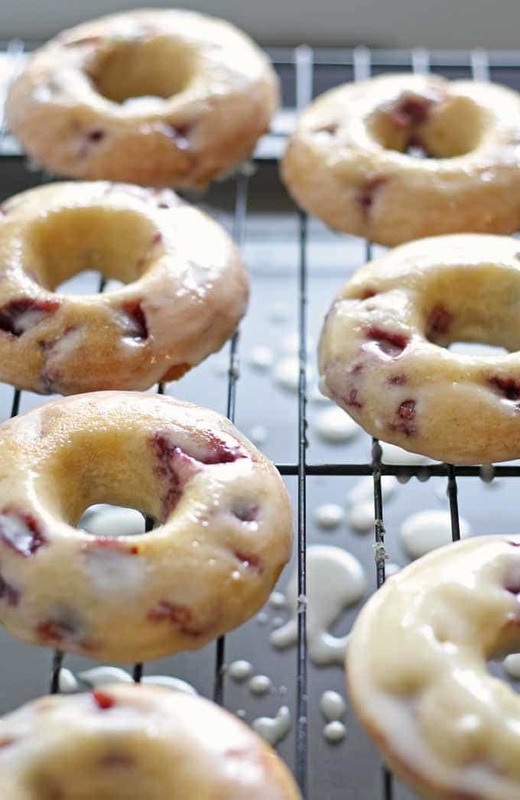 These are some seriously gorgeous doughnuts right here! These look really delicious. I love doughnuts, and these will be a new flavor for me. Thanks Stephanie! I hope you enjoy them! Awesome! Thanks for pinning, Kelly! You’re welcome Anita – I promise you, they are as tasty as the look! WoW !! Pinned. Great idea! 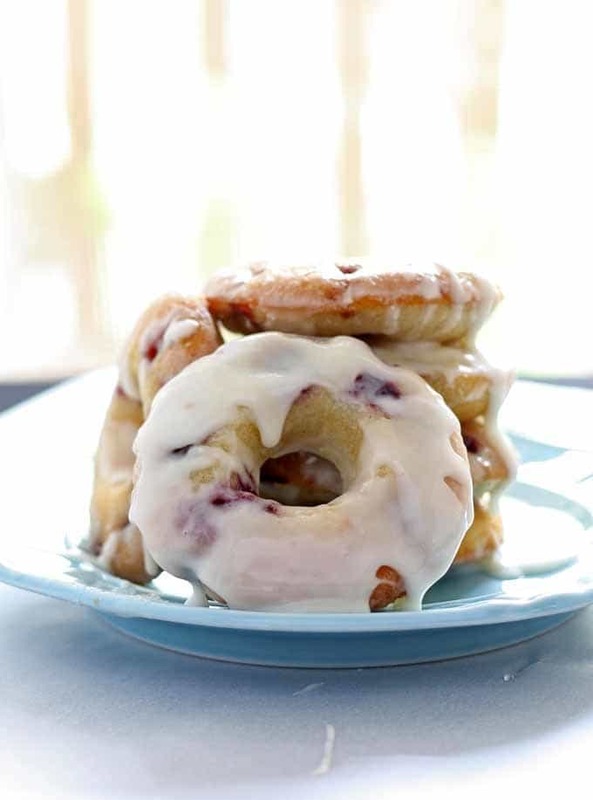 This looks absolutely sinful, great post! My neighbor gave me a gallon of fresh cherries today and there’s no way we’re going to eat them all! Your recipe sounds perfect, I’m going to make it tomorrow. The only thing is- can I substitute vanilla extract? I know it won’t be quite the same, but we’re eking out our supplies til payday, iykwim. If so, how much should I use? Thanks! That is a good question, Season, and one I unfortunately don’t have a definitive answer to. I have never subbed vanilla extract for the beans so am not sure my next suggestions will work. If I were testing it out, I would add an additional teaspoon of vanilla extract and reduce the milk by a teaspoon. You could also try omitting the vanilla beans altogether. I will put testing these 2 suggestions on my test recipe list but probably won’t be able to try it out soon enough. I hope that my suggestions work out for you!